The Sandstone Volunteer Group was created in 2003 to restore the once popular outcrop at Bulls Hollow which had become overgrown and heavily overshadowed by the surrounding trees. Since then a number of projects both small and large scale have been carried out at other outcrops including major works at High Rocks, Stone Farm and at Harrisons, which is still underway. 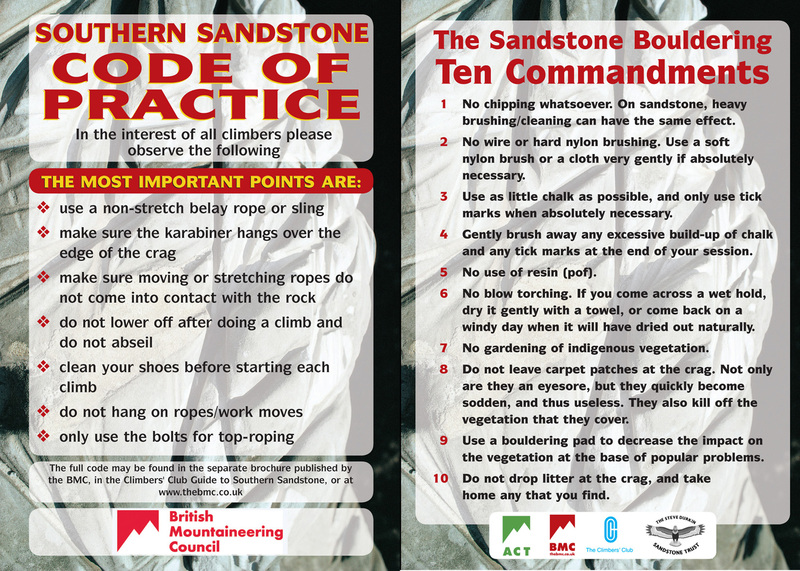 ‘Open Sandstone Meetings’ are held twice a year to report on the current situation at each of the main crags and discuss any necessary action required. Information on less frequented outcrops or other issues concerning the sandstone climbing environment are also covered as matters arise. We have installed signage at the major outcrops to encourage good practice, discourage graffiti and inform climbers of local problems regarding access etc. 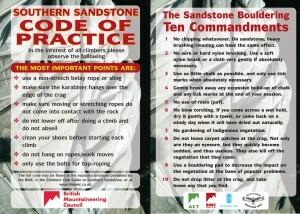 We have also issued leaflets and postcards outlining the key elements of the Sandstone Code (see above).